Opposition politician Nelson Chamisa (file photo). 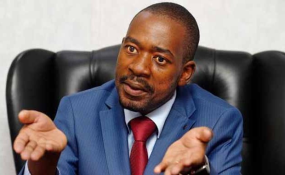 Opposition MDC leader Nelson Chamisa will not attend a meeting of political party leaders called by President Emmerson Mnangagwa at State House this Wednesday. The National Patriotic Front (NPF), which is linked to former president Robert Mugabe, also ruled out attending the meeting. Party leaders who confirmed they would turn up include Thokozani Khupe (MDC-T), Lovemore Madhuku (NCA), Noah Manyika (BZA), Nkosana Moyo (APA) as well as Daniel Shumba (UDA). The meeting, which will discuss a framework for national dialogue, was confirmed by the chief secretary to the president and cabinet Misheck Sibanda and invited the nearly two dozen contestants in last year's presidential ballot. Chamisa, who came a close second to Mnangagwa in the disputed vote, has refused to accept defeat despite the Constitutional Court dismissing his legal challenge against the election result. The opposition leader has repeatedly called for a national dialogue to resolve what he describes as a legitimacy crisis around Mnangagwa which he says is responsible for the country's economic and political meltdown. Even so, the MDC leader ruled out attending Wednesday's meeting. Commenting on Twitter, Chamisa said the country needed "dialogue, not games". We've a political crisis arising out of a disputed and rigged Presidential election result in Zimbabwe. The Presidency is disputed, we need genuine dialogue under a credible Convener and mediator to solve this crisis. "Stop citizens abuses, beatings and arrests." In a statement, his party said it was "disappointed that the president's precipitous invitation seems to be an attempt to pre-empt efforts towards genuine dialogue". Several minimum conditions needed to be satisfied for dialogue to take place, the party said. These included the "immediate release of political prisoners, the cessation of the current clampdown by the state and the return to barracks by the armed forces; and a full disclosure of the number of citizens killed so far, those injured, and the requisite action to deal with the perpetrators." Also snubbing Wednesday's gathering is the National Patriotic Front (NPF) which is linked to former president Robert Mugabe. The party did not contest the presidential election but won a seat in parliament. Spokesman Jealousy Mawarire said national dialogue could not be presided over by Mnangagwa. He dismissed Wednesday's talks as an attempt by Mnangagwa to hoodwink Zimbabweans and the international community. The NPF, Mawarire, insisted could not participate in talks with a president whose regime has incarcerated some of its leaders and forced others into exile while brutalising ordinary Zimbabweans for protesting against economic hardships. We believe that genuine dialogue that will restore constitutionalism, the security of citizens and the dignity of the Zimbabweans, among others, can never be convened by the Commander-In-Chief of the same security forces accused of brutalising our people," he said. "As a party, our Deputy National Commissar, Jim Kunaka and our Mashonaland Central chairperson, Dickson Mafias, are languishing in prison as political prisoners. "Several other high-ranking officials have skipped the country's borders, running away from alleged state security agents hunting them as if they are common criminals. "In light of our current circumstances we believe, as a party, that dialogue aimed at extricating our country from the current mess should be convened, facilitated and guaranteed by an international body given powers to superintend over the implementation of any agreement (s) that would come from therein." Meanwhile, a number of other opposition parties confirmed they would attend the meeting in separate interviews with NewZimbabwe.com. "Yes, we have received the second letter and we are going to attend the meeting," MDC-T deputy president Obert Gutu said. Build Zimbabwe Alliance (BZA) presidential candidate Noah Manyika said he had strong reservations but would still attend the meeting. "I will attend this meeting to hear if he is now prepared to do so and will only be prepared to join any continuing dialogue if this is clearly the case," Manyika told NewZimbabwe.com. In my view, real and meaningful dialogue that will lead the change we desperately need in our country can only happen if the people wrongfully detained have been released and the army is withdrawn completely from the streets and from manning roadblocks." Francis Danha of #1980 Freedom Movement Zimbabwe said; "We knew they will come back to us. "We are attending the meeting and we are prepared to rebuild the country, but if Mnangagwa is not sincere we will disengage."